We are back from "bacation" & back in FULL swing of crazy life here at our house (I'm sure I didn't expect anything less)!! I have TONS of pictures to share! Right now, I'm tagging clothes for our school fall/winter consignment sale & getting ready for Big O's FOOTBALL meeting this afternoon (break's over folks...football season is upon us...Ack)! Today is going to be my LAST post on this blog. Yeah, it's time for the big, exciting "CHANGE" I've been telling (teasing) you about! 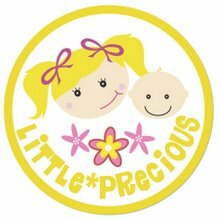 I've been thinking about changing blogs for awhile now...I have been sewing my camera strap covers & haven't sold children's clothing as "Little Precious Boutique" in a very long time. I LOVED being Little Precious, I taught myself how to sew & did it well enough to sew clothing for profit...a HUGE accomplishment for me! But, my little family is just too demanding to take on big sewing orders & that's just not who I am anymore. Seldom is anything about ME around here...you know how it is if you're the mom...you can be hanging over the bowl barfing & dinner is still expected to be on the table, on time! SO...I picked a new name...I tried to keep it simple...I chose THREE words that will tell you a million things about me, before we've even met! Come on over & take a peek! This blog will remain active in case you need to look up something (use the search box in the top left hand corner). I hope that you will bookmark my new blog, I'll have a BUTTON for you to add to your blog page very soon! It's Show Us Where You Live Friday on Kelly's Korner day! I LOVE having the opportunity to do this because it made me get out & take some current pictures of the outside of our house. I have a folder on my computer that has photos of the house from the beginning to now & I LOVE to go back & see how much things have changed...we have REALLY put a lot into our yard in the last two years that we have lived here! It's NOT DONE...not by a long shot...but we've got our feet on the ground, running! Let's take a walk & I'll show you around. This is the side of the house that we don't use all that often...this landscaping was done after the house was finished two years ago & has already started to mature...we are so, so happy with it! Here's the pool house that we finished last summer...landscaping will get going this fall. We're putting in some trees over here & maybe putting a pretty swing on this side of the house too. The play set....that HUGE yellow flowering plant came from my granny's house after she passed away. I dug up just a small bit of it...SMALL, like one piece! It's MONSTROUS! I like to see it over here...she LOVED to get out & play with my kids...she taught Big O how to hit a ball off a tee, how to ride a bike...she was ALWAYS out playing WITH them instead of watching them play. Seeing this flower out here with them makes me so happy, because I know she's watching over my babies when they're playing. Down at the pond...which was small when we bought the property, but had it dug out QUITE a bit to level off our yard after the pool was finished. and here's our "Garden"...hopefully we're going to get some squash soon!! Whew, it's a big yard...lots & lots of work!! I hope you'll visit Kelly's Korner & see all the beautiful yards & garages that are being shared over there today. I'm up & running....lots to get done before our big family trip to the BEACH! Also, after our trip I will be cleaning out closets...I already have a HUGE box of Miss O's outgrown stuff, mercy that girl has GROWN! I'll be cleaning out little boys size 2T & girls size 7/8....LOTS of Matilda Jane goodness too! ;) Be sure & check back, I'm clearing it out! Recovering from a weekend out of town, doing some bedroom make-overs, & getting ready for our big family trip to the beach!! Whew, I need a nap (or some chocolate)! Last weekend we went to Arkansas to visit our pals, Sharae & Charlie and their three beautiful boys! We just had a great time relaxing at their house & enjoying that awesome yard they have! It was H-O-T, but it didn't stop big boys from hanging out down by the pond to fish...Big O has been ALL ABOUT fishing lately, he is SO funny! It was a great visit for these guys...they've been pals since Kindergarten...I LOVE that they are still best buds going into 6th grade (even if they do live in different states). Sharae & Charlie before dinner...Charlie fixed us the most AWESOME dinner, I was full for two days!! The "big boys" down by the "man cave" (aka, Charlie's detached garage, LOL)...they were busy plotting their next escape (aka, hunting/fishing trip...)...oh, they wear us out with that! Sweet, sweet CM...oh, he has grown so much since they came to visit us a few months ago! The heat was so harsh (101 when we pulled in the driveway at 7pm)...really, the only place to be was in the pool! Tomorrow is Share Where You Live Friday again on Kelly's Korner...Garage or Yards...I hope you will join in on the fun! I'm going to try & get some pictures outside this evening after Daddy P gets his mowing done. I've been reading a lot of DIY goodness this summer & it has gotten me so excited about SPRAY PAINT! It is SUCH a quick & CHEAP way to get a BIG WOW out of your project! I've already tried my hand on that old little table. and NOW, I opened a new can this old DESK! 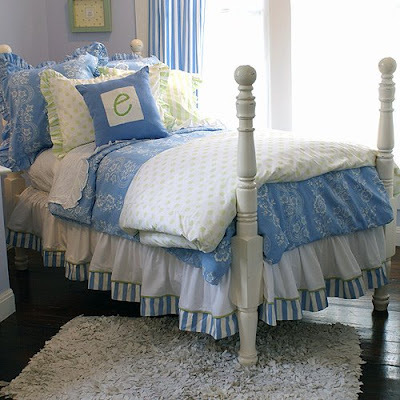 I recently saw where Jenn did a make-over with some older furniture for her daughter's room...is it not TDF!!! I love this! Ok, so here's where I need your help. This CHAIR is not cutting it. I thought I would leave it the original color & they would go together ok...but, alas...the chair is in a funk now that it's partner is all spiffed up! I'm going to recover the seat with Euro Bandana fabric (laying in the chair). 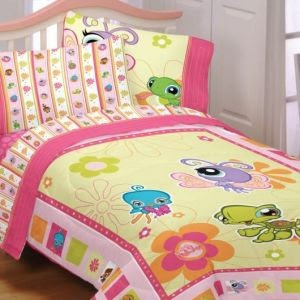 I went ahead & ordered several more yards of this fabric & plan to make shams & a duvet cover for her bed (since that Littlest Petshop comforter has ALREADY started to decline...yes, after just ONE wash...tisk, tisk). So, what about that chair...if I'm covering the seat all bright & pretty...should I paint it BLUE to match the desk or bright pink (darker than the wall) or maybe apple green?? Or should I get an ivory & just give it a nice solid off white, clean up coat? I think I had better get off this computer & get busy before my lovely children tear the house apart...I hear the makings of "fort town" in the upstairs hall (those biscuits gather up every single cushion & pillow in the ENTIRE house)...I need to contain it before it gets out of control! I am so incredibly ANTI-character...I do LOVE movie & toy characters, but just not on my kids bedding & clothes (well, jammies are fine, & t-shrts are ok too...). Miss O & I have been at battle over her bedroom for months now! I should have known that SHE would have something else in mind...lately we are NOT on the same page & I'm having to start digging deep to let her make her own choices a little & be her own person. Thankfully, it's horrible quality & will be in shreds within a year. But the funny thing was this morning, when she got up...she SHOWERED, dressed & had that bedroom spit-spot before coming downstairs. Yeah, I'll leave you with one more post for the weekend...remember our news about our new puppy? Here's a new video of Sweet Katie Scarlett & her family...are they not PRECIOUS!!! Only a few more weeks until she'll be coming to live with us, we are WAY excited! and if you're a Doxie fan, you MUST visit Doxie Crafts...ohhhhhh, cuteness galore!! Well, this week's theme is Master Bedrooms! Mine is pretty barren...I haven't made it back there yet. There's NOTHING on the walls...the big jumbo recliner made it's way back there for Daddy P to relax (& little does he know that it will be RELOCATING to this "theater room" that he's planning up...((like we need ANOTHER tv in this house))....and it will be replaced by someone slim & pretty...). The TREADMILL is in our bedroom & where I HATE the way it looks, I LOVE to have it in there...our bedroom is on a separate air unit & it's always like a meat locker back there...mighty nice to get a sweat going where it's nice & coolish! ;) But, it shall also relocate in the future. We decided to go with Porter Paint's Charleston Blue on the walls & Buckwheat on the ceiling (this is the same yellow we have in the playroom too). In the bathroom the walls are buckwheat & the ceiling is blue. Our one BIG spurge was on the custom, wooden plantation shutters...with a paint called Charleston Blue, it just seemed "fittin" to have the real thing on the windows! The bedding came from Private Quarters (but the accent pillows all came from TJ Maxx). I had a party with them & got my bedding for a steal! We also have their famous SPA SHEETS on our bed...they are TDF...absolutely TDF! I bought them for Christmas gifts a couple of years ago for my sister & my mother in law...they STILL swoon & carry on about them when they're brought up...they are FABULOUS!! I'm hoping to get the kids pictures done this fall & have them put up on that wall by the treadmill. Other than that, I don't have any plans back there yet...until inspiration strikes, I guess I'll just leave it as it is. I'm so glad you stopped by to visit. Be sure & check out all the other other fabulous master bedrooms being shared today over on Kelly's Korner!